I’ve conducted several reviews of international development organisations, looking across their portfolio of programmes to assess and compare impact. Each review has run into a key problem – nobody could tell us about any finished programmes. We were given enthusiastic reports about current and upcoming projects, but all the completed ones had been forgotten. It makes me feel a bit like Bill Murray in Groundhog Day, stuck in a permanent and repeating present. This has really highlighted for me the problems of institutional memory in our sector. All too often, programmes are forgotten about straight after they’re finished. If there is an evaluation, it’s conducted, filed, and then lost. This has two obvious negative consequences. Firstly, we never really learn from the past, as ‘lessons learnt’ are swiftly forgotten. Secondly, there are few considerations of sustainability (or incentives to consider it.) Evaluations are almost all short-term, and nobody revisits the programme any later – because nobody knows that there is a programme to visit. This isn’t an original critique. (In fact, Aidleap has made it in a previous post, though our proposed solution there was pretty unpopular.) But it is curiously unaddressed, both in the development and (as far as I know) the academic world. So I propose a reasonably simple solution. We undertake some evaluation archaeology; we find and evaluate an old and forgotten programme . First we need to find a programme that finished ten or so years ago. Obviously records will be hard to come by, especially as this was in the early days of the internet, but hopefully there will be something etched on stone tablets in the depths of DFID’s archive. And then, like Bill Murray breaking out of his time–loop, let’s go and evaluate it. We could see if anyone still remembers the programme, whether any farmers use whatever technology it introduced, or whether it has any impact on the workings of government and other systems today. Obviously there are technical challenges in assessing impact. There is unlikely to be any baseline data, and certainly no control groups. Recall (asking people what happened in the past) is dodgy at the best of times, and pretty meaningless after a ten year gap. However, with a good understanding of what the project was trying to achieve, secondary data and monitoring reports, it should be possible to find out something worthwhile about the sustainability of major programmes. For example, evaluation archaeology into a programme that set up self-help groups could learn whether any groups are still going after 10 years, and what factors underlay success and failure. This is likely to tell you far more about what really works than an evaluation conducted straight after the end of the project. Does anyone know of an evaluation which did this? Is anyone interested in collaborating on such a project? I once went to visit Kibera slum in Nairobi. Walking through the streets, I passed a group of guys dragging a heavy log through the mud. One of the men turned – he looked a bit drunk – and yelled out “hey, mzungu! You think we’re giraffes? Go to a safari park!” His friends laughed, my guide nervously pulled my arm and told me to move on. I felt extremely uncomfortable. The guy pulling the log was of course right. I was a ‘slum tourist’, paying to see areas of intense poverty. Slum tourism has come under considerable intelligent criticism, including from Kennedy Odede and Jamal Osman. These critiques are eloquently summed up by the quote above; slum tourism turns people’s lives into safari parks. Critics claim it objectifies poverty, giving rich tourists an interesting experience but nothing back to the community. I think that picture is too simplistic. In Kibera, I was not struck by the poverty and deprivation – but by the vibrancy, quality of infrastructure, and colour. It was a world away from the sterile, sewage-ridden mess that I’d imagined. 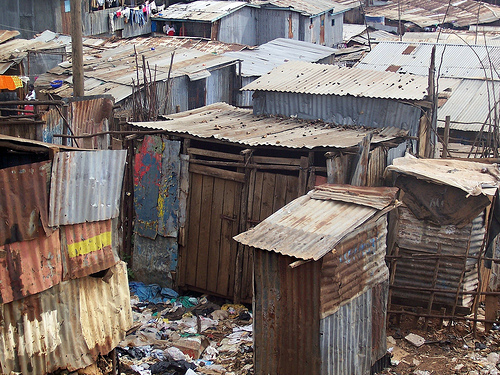 I had no idea that there were rich areas of Kibera, with expensive churches and wealthy businessmen. I had no idea that you could buy iphones, get haircuts, and set up an internet connection there. At least personally, I think my slum tourism experience improved my understanding of Kibera. Moreover, I suspect the angry man I met was the exception rather than the rule. One study found that the single most common reaction from slum residents was apathy. More broadly, I think one of the biggest risks facing places like Kenya (and the UK) is the increasing separation of rich and poor. The rich spend more time in wealthy ghettos, and have no reason to go to the poor areas. Asserting an ethical principle that rich people shouldn’t go to poor areas just reinforces this trend. Obviously a simple slum tourism experience is unlikely to radically change anyone’s worldview, but I think it is important that people make an attempt to move outside their normal comfortable circles. Pick the organisation carefully. Go with an organisation with links to the local community. You should be taken round by someone from the slum, and at least some of the money should go back to the local community. This should happen directly as well as indirectly. For example, they should encourage you to shop locally, as well as using a percentage of your payment for community projects. Don’t take photos. Many negative accounts of slum tourism focus on the distance that photographs put between the tourist and the subject. As Kennedy Odede says; “They get photos; we lose a piece of our dignity.” If you absolutely have to take photos, then ask permission first, and don’t single out the most stereotypical ‘slum-like’ view for your photograph. Look for the beautiful aspects of slums. Ultimately, I think it’s your attitude that determines the impact of slum tourism. Slums aren’t one-dimensional collections of poverty and deprivation – but if that’s what you look for, that’s what you’ll find. Interact with residents. It’s uncomfortable to interact with people when you’re a tourist, especially for us emotionally stunted English people. However, one of the key criticisms made by slum dwellers in this study was that tourists didn’t really talk with them. If you find it hard to start a conversation with someone on the street without sounding like an idiot (“So…what do you do?”) an easy way to start conversations is to buy small things (like water, sweets, or crisps) from local shops.